Although there are several other airlines now flying to Iceland many of them have a poor reputation for timekeeping and cancelling flights, so we went for the home team. Icelandair also own and operate many of the local hotels and offer great package deals including entry to the Blue Lagoon, Golden Circle tour and even whale watching. Once we'd factored this in, and because we were flying at different times it was easier and about the same price to book individually, but I would always check the cost of a package with Icelandair, even if it just means you get airport transfers for free (as these can work out pricey especially if you take a taxi). I had issues with their baggage check on both journeys; even though I'd checked in online I had to wait in the regular queue to drop off my case, and on the return I got shuffled around as they had some problems with my case. Neither of these was a big issue, just inefficient. 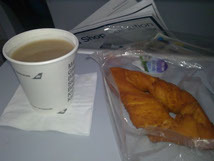 The flight benefited from free movies and decent food which meant the hours simply flew past (I know, terrible pun).